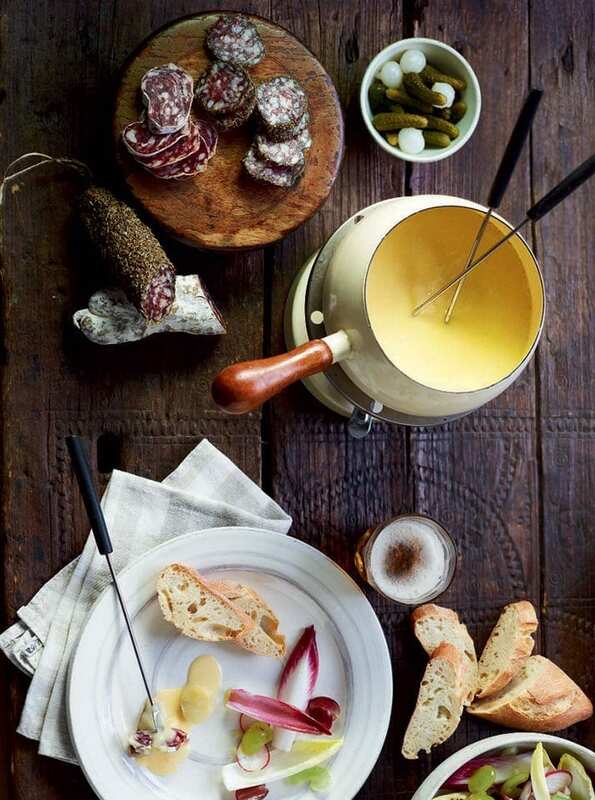 This moreish fondue recipe is made with three different types of cheese, garlic and beer. Pile the accompaniments high and let guests help themselves. Put the potatoes in a pan of cold water, bring to the boil, then simmer for 10 minutes. Drain, then set aside and keep them warm while you make the cheese fondue. Heat a fondue pot or big heavy-based pan over a medium heat, add the garlic and beer, then sizzle for a few minutes until the liquid has reduced slightly and the garlic is lightly cooked. Stir in the cheeses and, once they melt, add the cornflour and lemon juice mix. Turn the heat to low – don’t let the cheese boil. Continue stirring the cheese mixture until smooth and shiny, but take care not to overcook or it may curdle. If this occurs, you can rescue the fondue by adding a little more lemon juice or 1 tsp cornflour mixed with a little water. Serve with the accompaniments and a crunchy salad.